The Folger Institute is excited to announce a fellowship as part of Before Farm to Table: Early Modern Foodways and Cultures, the inaugural project of the Folger Institute’s Mellon initiative in collaborative research. Each Before “Farm to Table” fellow will be awarded $10,000 for work in the Folger collections on topics related to early modern food and foodways in the British world, broadly conceived. This special semester-long residential fellowship will be available to scholars in either Spring or Fall of 2019. The deadline for applications is September 1, 2018. The Before “Farm to Table” team is proud to work with the Mellon Foundation on this exciting initiative. Founded in 1969, the Andrew W. Mellon Foundation supports a wide variety of arts and humanities projects and organizations, including museums, centers of cultural heritage, and institutions of higher learning. The Folger Institute’s Mellon initiative will re-invigorate deeply rooted forms of humanistic inquiry, ones that the Folger is particularly poised to facilitate through collaborative discussions around its collections. The Before “Farm to Table” project uses the pervasiveness of food in everyday life as a window into early modern culture. Food, then as now, is a basic human need. It also has a history and is a gateway to understanding society and culture. Throughout this project, we will investigate big questions about the way food participates in and actively shapes human knowledge, ethics, and imagination. Some of the issues we are interested in exploring include the unevenness of early modern food supplies, the development and spread of tastes with their darker supply sides of enslaved labor, and the ways that the rituals of eating together could be both socially cohesive and compulsory. The Folger’s collections offer some obvious, and many not-so-obvious, items relating to food in the early modern period. 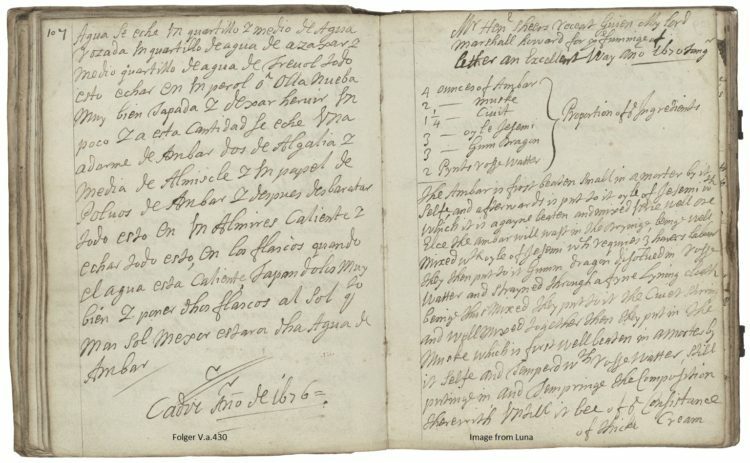 The Folger holds the largest collection of early modern British receipt books (manuscript cookbooks) in the world, and most of these are open-access, available to view in the Folger’s Digital Image database, LUNA. These receipt books represent the collected cookery and medical recipes of both individuals and families. Many recipes contained in these books were copied from print cookbooks, other manuscripts, or attributed to other named individuals. Some bear the markings of intimate family stories. Several pages of V.a.430 include adjacent Spanish and English pages. Note the left page dated Cadiz Año de 1676. Consider Cookery and medicinal recipes of the Granville family (V.a.430), which was begun in the mid-seventeenth-century and has final entry dates from the mid-eighteenth-century. When Anne D’Ewes (née Granville) was gifted the book from her mother in 1740, its pages contained many recipes that her family had accumulated nearly a century earlier while stationed as consuls in Cadiz, Spain. A scholar of trans-national culinary traditions might study this text to determine what (if any) influence these Spanish-language recipes had on multi-generational family tastes. 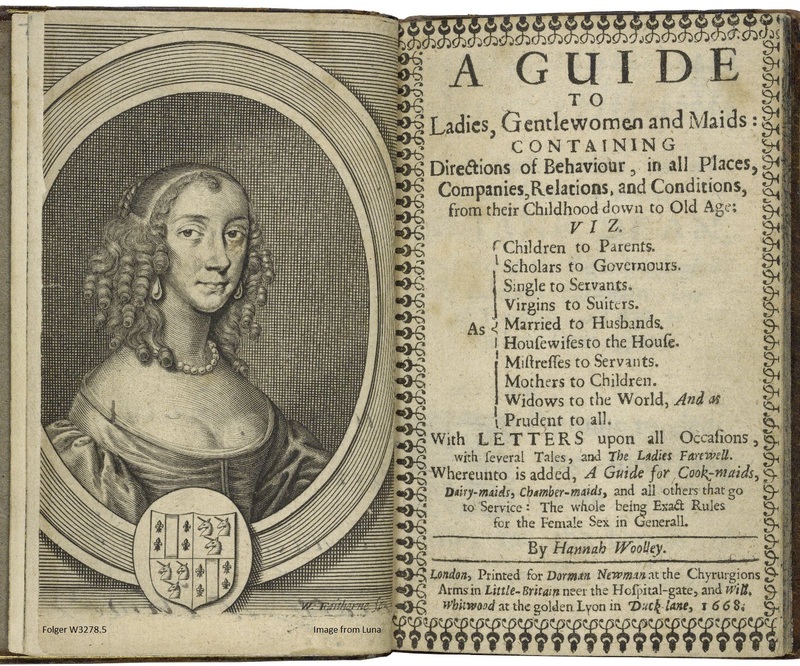 Hannah Woolley, A guide to ladies, gentlewomen and maids: containing directions of behaviour, in all places, companies, relations, and conditions (W3278.5). 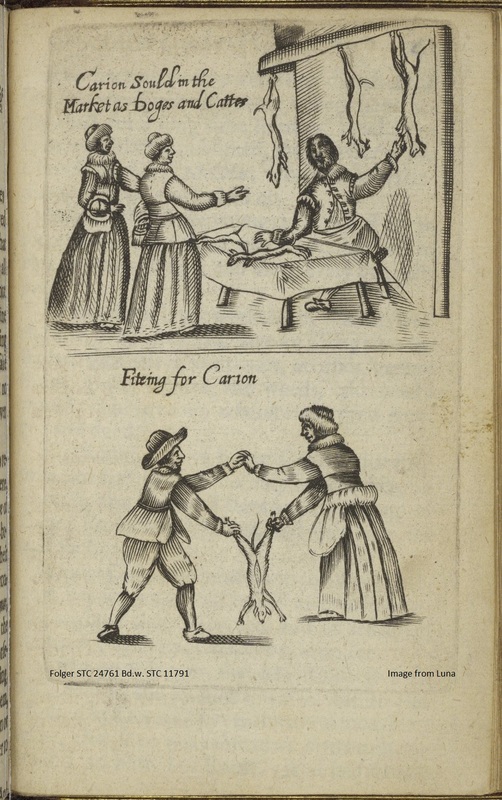 The Folger also has a substantial collection of print cookbooks, including the works of the celebrated author Hannah Woolley (1622 – c. 1675). Woolley was a wildly successful writer of books on household management literature. She wrote books addressed to middling- and upper-class women that contained advice on cookery, medicine, and what might be considered a forerunner to the field of home economics. Woolley’s runaway success saw one of her works, The Queen-Like Closet, re-printed five times. Scholars interested in the way that seventeenth-century women understood, enacted, and presented gendered labor would find much of value here. Paradisi in sole paradisus terrestris. or A garden of all sorts of pleasant flowers which our English ayre will permitt to be noursed up (Folger STC 19300 Copy 1). 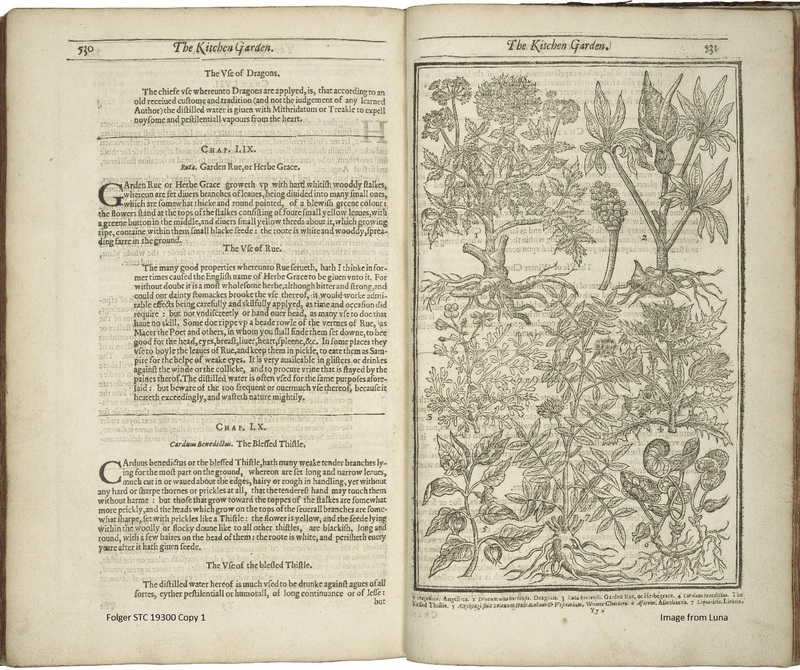 Scholars who study early modern human interactions with the enviroment will be well-served in the Folger’s collection of herbals and agricultural manuals. Plantarum historiæ universalis Oxoniensis (245- 050f) is a richly-illustrated catalog of the plant life growing at Oxford, while Garden of all sorts of pleasant flowers (STC 19300 Copy 1) promises to guide the reader through the cultivation and use of various plants. But the early modern environment was also a place where power was deployed and resisted. Consider, for example, Thomas Leake’s Register of deer, hinds and stags, killed in Sherwood Forest, 1591-1598 (V.b.152), which includes among its contents nearly a decade of reports on unlawful poaching. Abundance and dearth, central to any study of early modern foodways, is another critical theme present across the Folger’s collections. Philip Vincent’s The Lamentations of Germany (STC 24761 Bd.w. STC 11791), a graphically-illustrated chronicle of the Thirty Years’ War, features representations of the violent conditions experienced by those unfortunate enough to be caught in the war’s path. As Vincent so poignantly demonstrates, starvation could kill as readily as any early modern army. The illustration of cats and dogs sold as meat are almost tame in comparison to the book’s horrifying descriptions of wartime infanticide and privation cannibalism. The book’s full title, which promised to expose “the woefull effects of sinne,” attempted to attribute some cosmological order to the earthly chaos: for Vincent, dearth was punishment. These are just a few of many resources that our Before “Farm to Table” fellows might consult in the Folger collections. For full application instructions, please visit the Before “Farm to Table” fellowship announcement page. Interested scholars should apply by September 1, 2018. Jonathan MacDonald is the Project Coordinator for Before ‘Farm to Table’: Early Modern Foodways and Cultures, a Mellon initiative in collaborative research at the Folger Institute of the Folger Shakespeare Library. Jonathan completed his M.A. in History at Virginia Tech and his B.A. in History at Christopher Newport University.